Do you remember our wondrous Tomato plant I last wrote about in my post You Know About Jack and the Beanstalk? And I said things were looking good for tomatoes at Christmas down here in the deep south of South Australia? Well-ll-ll, we had all the tomatoes my heart desired for Christmas…and….wait for it…is that a drumroll I hear? WE ARE STILL PICKING THEM, and I really believe this trusty bush may see the end of the financial year. It’s half dead, but the parts that are still green are producing bigger tomatoes than before, and flowers still keep bursting out of the spindly branches. It really should be pulled out, but I just haven’t got the heart for it, when it’s given its all to me and mine, and still giving. Look at the poor thing – only a Mother could love it….and I do. Not only have countless little darlings graced our salad plates, and those of family and friends – I also made several jars of microwave Tomato Chutney and countless meals of Spaghetti Bolognaise – but the most spectacular concoction has been Not Sun-Dried Tomatoes, done for an hour in the slowest oven, then into my dehydrator, and then into a lovely mix I made with oil and garlic and oregano and cracked pepper, and then they marinate for some time and then we have……. Christine’s Sundried Tomatoes in Oil. And they are so yum, especially with some lovely cheeses and crackers – a favourite of ours for tea after a larger lunch. With a cheerful glass of red, or two or three, Life is a regular bowl of tomatoes. When my amazing bush finally goes to meet its Maker, The Big Tomato in the Sky, I will place a PS on the current post of that day with a short but eloquent eulogy. It’s the least I can do for this beloved bush as it goes to a better place. Hmm…on that note, I think I’d better get outta here. Speaking of PS’s (?) 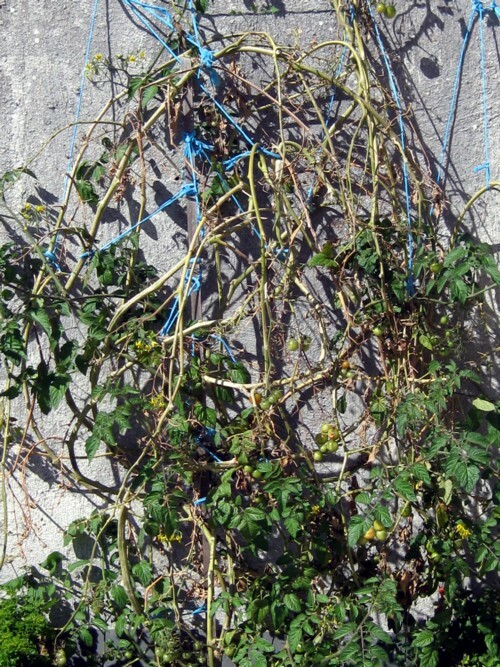 – how about the blue baling twine to tie up the trusty trusses? All was well when the bush was in full leaf, but now it looks decidedly off. Green twine next year, that’s for sure.